Our GoToWebinar integration is an indirect integration that allows you to use ONTRAPORT Smart Forms to register contacts for a webinar event and follow-up accordingly. Through this integration, any new contacts registering for your webinar will be added to your ONTRAPORT database. 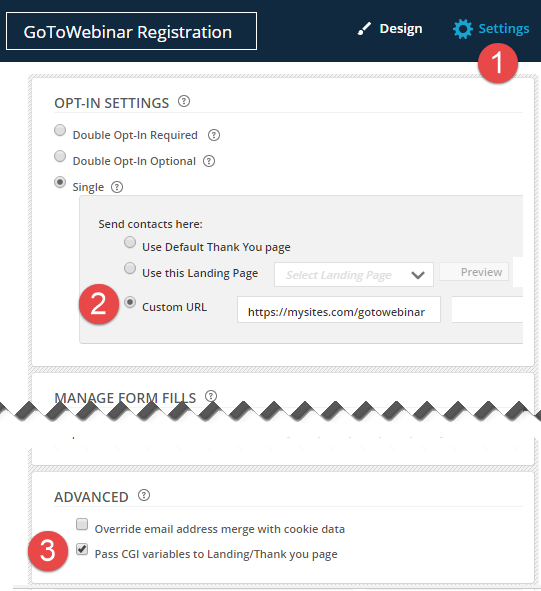 Registrants will receive GoToWebinar's notification email (with the link to the webinar itself) as well as any automated reminders and follow up messages you set up in ONTRAPORT to contact attendees after the webinar, etc. There are 2 ways to do this: the file host method and the ping URL method. The file host method requires hosting a PHP file on the registration page. This cannot be done on an ONTRAPORT Landing Page or in a default WordPress configuration. The ping URL method is the ideal choice if you're unableto host the PHP file. There are two different Ping URL methods depending on the type of GoToWebinar account you have. All non-United States GoToWebinar clients are deemed "Global Clients" by GoToWebinar. US based clients may have either the "Global" or "US" account. If the word "global" appears in the URL when you are logged into GoToWebinar you are a "Global Client" for the purposes of this integration. You will need to follow the steps listed below for your account type each time you host a webinar because a new meeting ID# is created for each webinar. We strongly recommend testing each form before hosting it. Quick tip: Many GoToWebinar accounts are created as "global" even if created by someone in the US. Log into your GoToWebinar account and view the URL; if it contains the world "global" the Ping URL integration should be set up using the Ping URL ("Global" Clients) method. Make sure that the fields for first name, last name, and email are REQUIRED and that all other fields are NOT REQUIRED in the registration section. Requiring other fields can break the integration. Make a note of the GoToWebinar meeting ID located at the end of the GoToWebinar registration form URL. Download the gtw.oa.zip file at the bottom of this article. Replace the bit of code in the file that reads WEBINAR_ID_GOES_HERE with the GoToWebinar meeting ID. Remember to end this line with the semi-colon character. Host the PHP script on your server in a subdomain or folder (e.g., mysite.com/gotowebinar). On the Smart Form's Settings tab set the thank you page to the URL from step 7 using the Custom URL section. Quick tip: Many GoToWebinar accounts are created as "global" even if created by someone in the US. Log into your GoToWebinar account and view the URL; if it contains the world 'global' the integration should be set up using the Ping URL ("Global" Clients) method. Make sure that all other fields are NOT REQUIRED. GoToWebinar must NOT have additional fields beyond First Name, Last Name, or Email Address set as required. The Ping URL pulls only these specific fields. Find your Webinar ID and copy it to a document for use later. Verify that GoToWebinar is set up for Email Notifications in the Change Sessions Settings drop down menu. You must use GoToWebinar and NOT ONTRAPORT for these Email Notifications. GoToWebinar generates a unique join URL for each GoToWebinar registrant using these emails. Create a Smart Form or Order Form in ONTRAPORT to accept webinar registrations. The Form must contain at least the First Name, Last Name and Email fields. 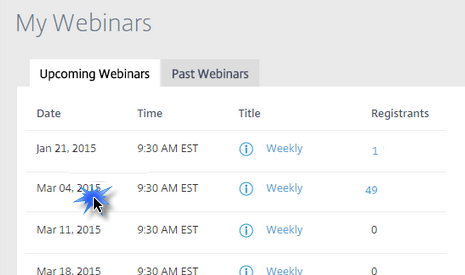 Add your GoToWebinar meeting ID that you previously saved directly to the very end of the URL. On the Registration page, under the Field Section, make sure that the fields for first name, last name, and email are REQUIRED and that all other fields are NOT REQUIRED. Quick tip: Do not have any other fields required! The Ping URL processes only the first name, last name and email fields. Q. My contact is not in my GoToWebinar, what is wrong? 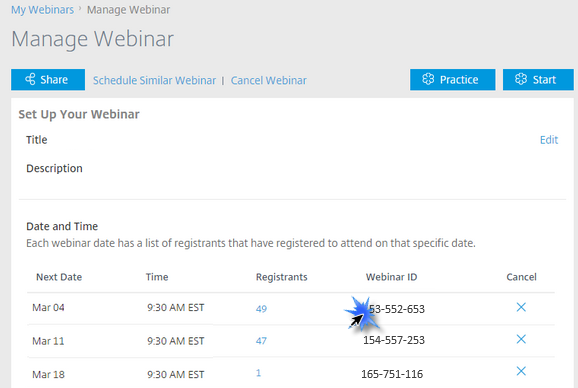 Are there any additional fields required within your GoToWebinar settings? Is the Ping URL copied correctly into the rule on your smartform? Is the Webinar ID placed correctly and completely into the end of the Ping URL? Q. What if I want to setup my GoToWebinar registration on an order form? A. You would need to complete the same steps as the Smart Form but will need to run the rule in the Run these rules if transaction is successful section. Q. Are there any integration options that allow us to automatically track how long a contact stayed with the webinar? A. FuzedApp supplies an integration that allows segmenting the attendees based on the length of time they spent in the webinar. I created a rule that pings the GTW URL and posts the data. Should I check 'Send as JSON' or no?